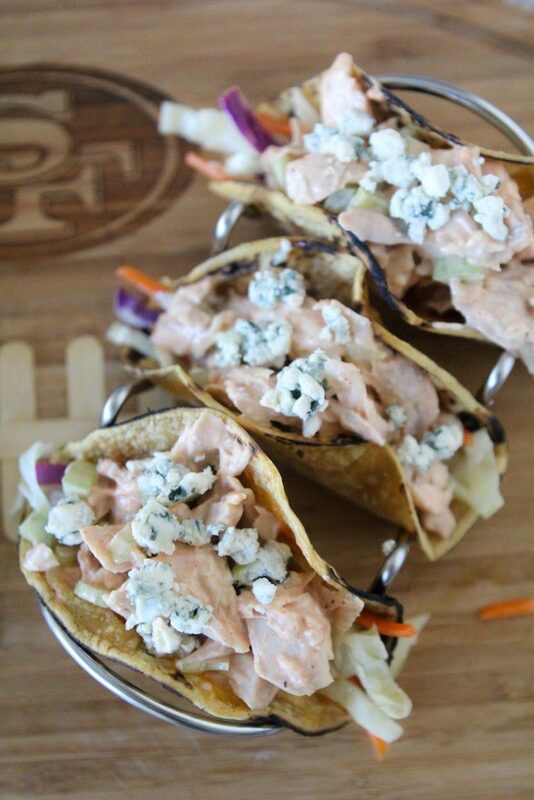 Gluten-Free Buffalo Chicken Tacos from the Whole Smiths with a Whole30 option. So easy to whip up and perfect for your gameday food cravings. A definite crowd-pleaser. 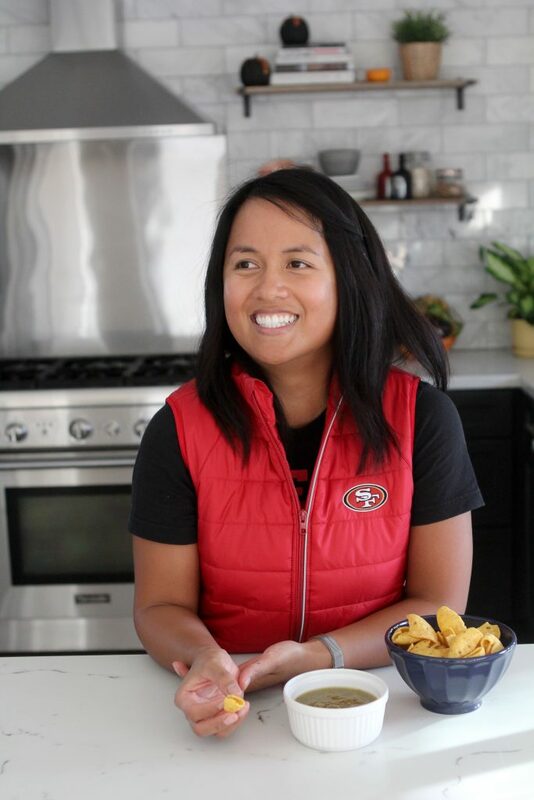 As you know, this year I’m a member of the NFL Fan Style Lifestyle Council, which means I’m sharing all sorts of fun football goodies with you all season long. Mostly giving you a peek into how my family and I enjoy football season in a fun and healthy way. From gear to food, I’ve got you covered. So let’s do this, shall we? I love how much Sundays have become our family time at home with the girls (and Gronk). It’s a day that we are able to just chill and spend time together. We rarely plan other activities and use Sundays as our family day. I just love how the girls will sit (and incessantly chat, for better or worse) and watch the games with us. It’s not quite how I used to watch games (i.e. in a sports bar) but it’s where my heart is now. Here’s how our Sundays usually go. The girls wake up before us and make a lot of noise so that we’re up soon thereafter. Brad will make us something extra yummy for breakfast, usually pancakes or waffles and I roll out of bed and start thinking about what kinds of grub I want to get ready for our day of football watching. After breakfast the girls run to get into their 49ers gear, and usually end up arguing about who gets to wear what. But whatever. It’s right about then that I realize I should leave immediately, gather myself and head to the grocery store to grab some food. Sorry not sorry Brad. 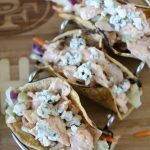 One thing that’s a must for me when planning our food is that it’s got to be easy (as these Buffalo Chicken Tacos are). 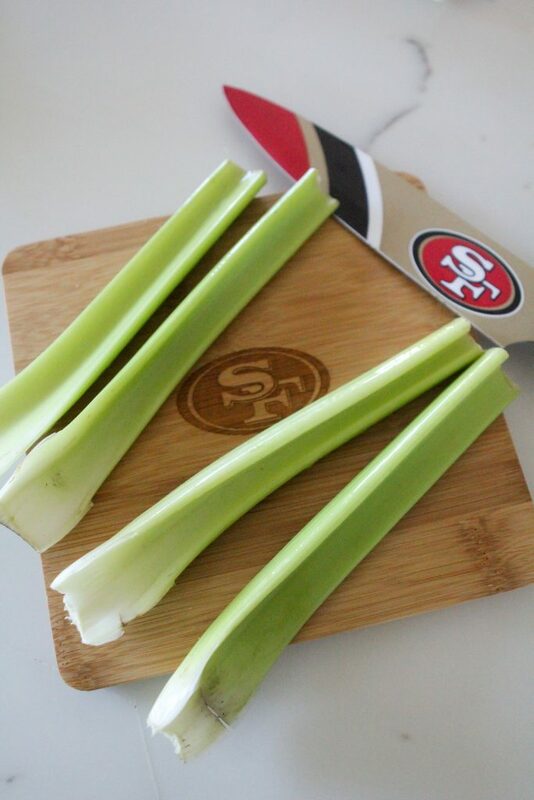 Because who wants to spend all day cooking rather than watching the actual game? Not me. 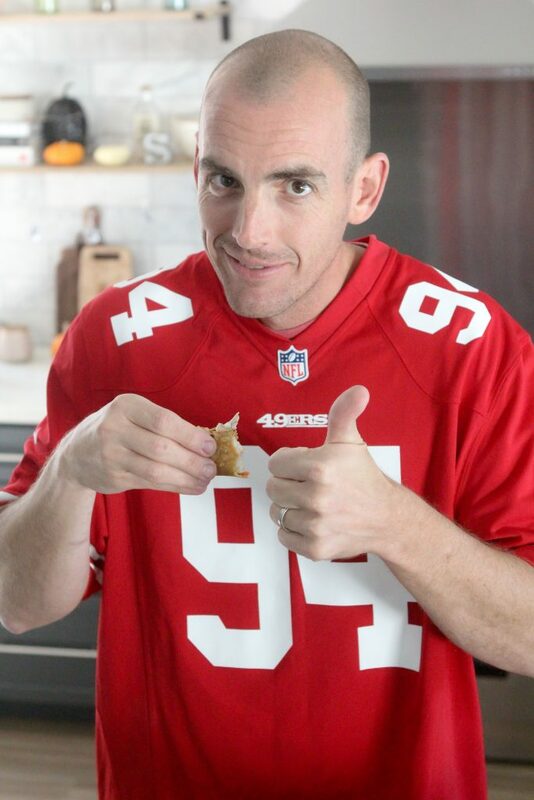 I also love serving it up with some football swag… -because it tastes so much better that way, doesn’t it? At the very least, it’s way more festive, wouldn’t you say? 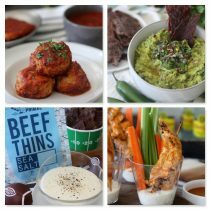 You can check out some of my favorite NFL kitchen / gameday serving essentials HERE. So here I am, back from the grocery store and I get everything all set to go. Drinks, snacks, meals etc. And if I’m really lucky, it will be a Sunday that my dear friend Beverly joins us. Beverly and I have been friends since Kindergarten and she is pretty much family at this point. I mean, 20 years (*cough, ahem, ha) of friendship will do that. So while the kids may be crazy and it’s a bit more chaotic to watch the game here, she still comes and chills and hangs with us. And isn’t she adorable doing it? You can find her vest HERE. Super Bowl 50 with Beverly. There’s a lot of things that Beverly and I love doing together, some include; cooking, going to New Kids on the Block concerts, Game of Thrones (another Sunday goodie) and football and the 49ers. 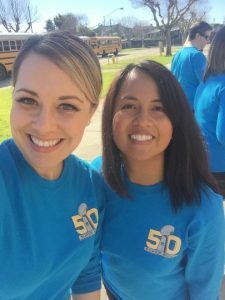 Two years ago we signed up together to be part of the crew for the Super Bowl 50 halftime show. We spent two weeks in the cold (cold for the Bay Area, i.e. not that cold) getting the stage built for Coldplay, Bruno Mars and Beyonce. If you’ve never thought about how they get an elaborate stage built and onto the field and disassembled and removed from the field in minutes, you’re not alone. I had no idea what it took to get that done but watching the process and being a part of it was simply amazing. 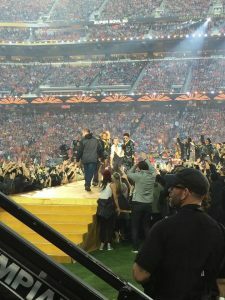 During the performance, we were on the field at the 50 yard line right in front of the stage for the actual show. I like to think I was technically one of Beyonce’s back up dancers. I mean, I kinda was? It was truly one of the most exciting, memorable things I’ve done and I’m so thankful that we got to experience it together. Back to football Sundays. Food? Check. Family? Check. Beverly? Check. Gear? Check and Check. Now that we’re all squared away, let’s chat tacos. I love these things so, so much. 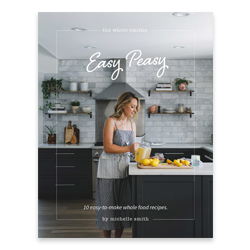 They are so easy to assemble (I use rotisserie chicken and pre-shredded slaw to make it even easier) and they pack a ton of flavor. And really, what goes better with football than buffalo anything. And everyone loves tacos, so why not combine the two. You can use any size corn tortilla to make these but I prefer the smaller ones but that decision is up to you. 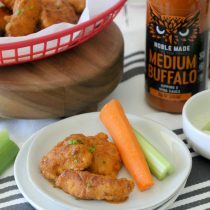 Let’s see what else… I love things extra spicy so I add a bit more hot sauce than is called for in this recipe so feel free to adjust the heat level for yourself. I just know if I make it as spicy as I like someone is going to say it’s too hot. But what is recommended in the recipe is a great place to start. 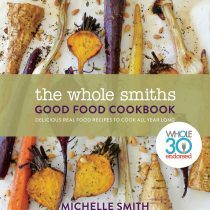 As far as making this Whole30 compliant, it’s really easy. Just make sure the mayonnaise you use is compliant, my 30-Second Homemade Mayo is great for this. And instead of using a traditional tortilla, hollow out a bell pepper and stuff the chicken salad into the cavity. And skip the blue cheese, but you already know that. 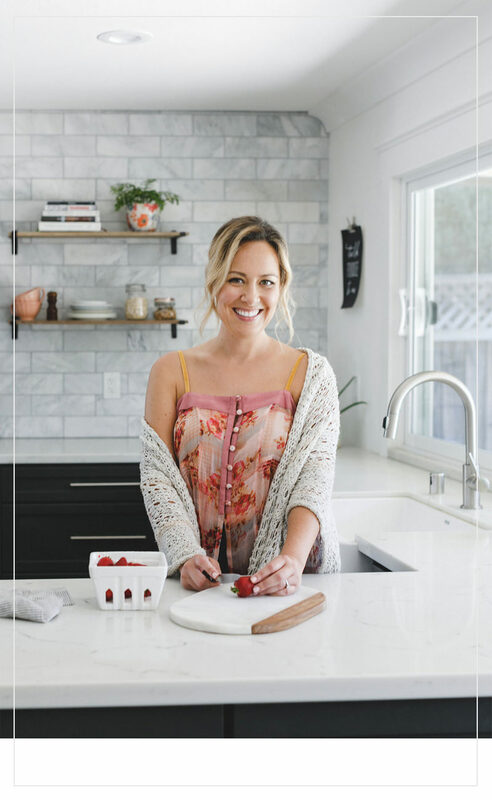 This type of recipe is perfect for those times when you’re doing a Whole30 but no one else in your life is. It’s so easy to modify but you don’t have to leave the rest of your family and friends hanging. You can bring it to gatherings and just assemble yours as needed. 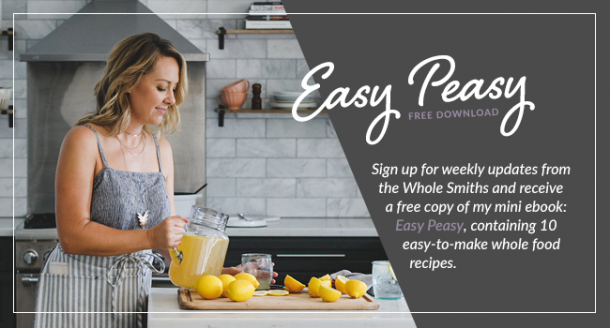 I wish I had some additional tips for you, but the recipe is that darn easy and tasty. For the mayo you can whip up a batch of my 30-Second Homemade Mayo. It’s a cinch and a total game changer. Brad and I practically inhaled these once I finished photographing them. See? He barely has any left in the photo despite me telling him to slow down, don’t really eat it, pretend to eat it, but actually take a bite, look happy while you take a bite, don’t chew it so much, smile, well not that big of a smile that’s super fake looking, ok fine how about just a smile and a thumbs up. That’s what it took to get this shot. He deserves another jersey for all of that to be honest. We got him one he’s wearing above for Father’s Day last year and you can find your own team here. With Christmas just around the corner a jersey makes a perfect gift for all of the mumbo jumbo Instagram husbands around the country have to put up with on a daily basis. Or just general mumbo jumbo, it doesn’t need to be limited to that of Instagram. Enjoy these tacos and don’t forget to tag me if you post them on Instagram… especially if it’s while you’re watching your favorite team! 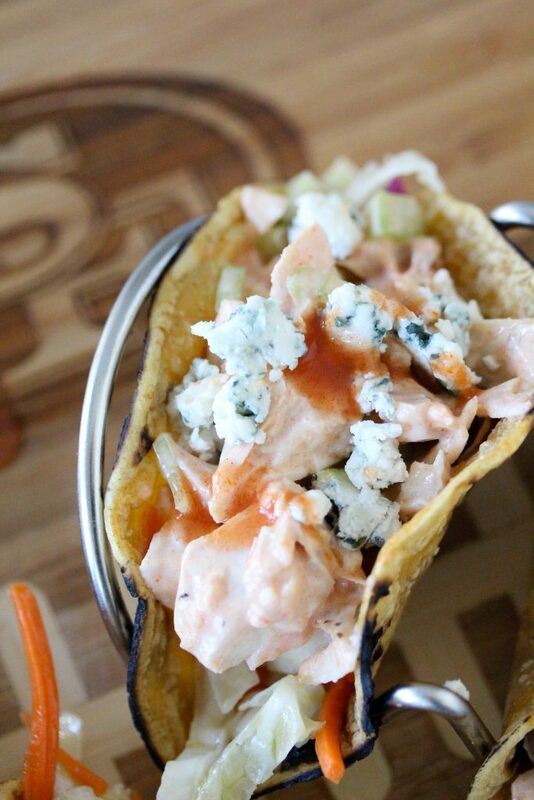 Gluten-Free Buffalo Chicken Tacos from the Whole Smiths with a Whole30 option. So easy to whip up and perfect for your gameday food cravings. A definite crowd-pleaser. Gluten-free. Combine the chicken, celery, mayonnaise and Frank's Red Hot together. Salt to taste. Whisk the olive oil, vinegar, and salt together in a large bowl. Add the slaw mix and toss to coat. To assemble the tacos add a some of the slaw onto the warmed tortilla and add the chicken salad. Top with the optional crumbled blue cheese and additional hot sauce to taste. 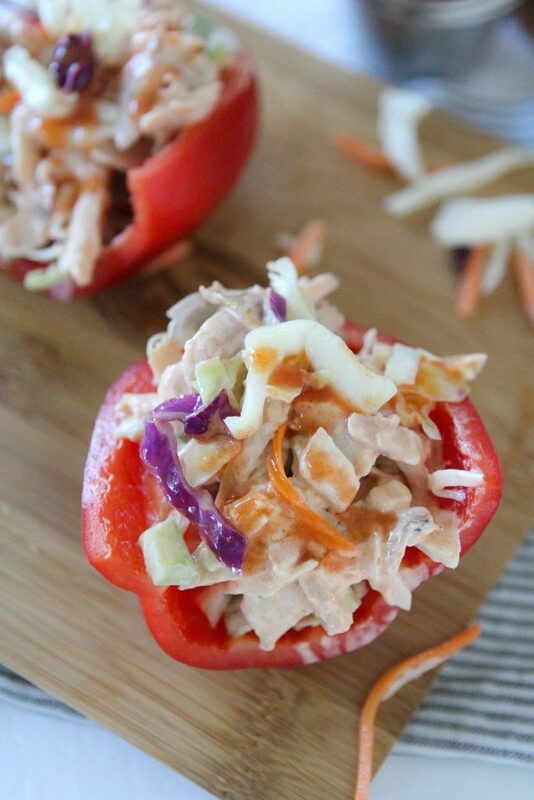 To make Whole30 compliant stuff the slaw and chicken salad into the cavity of a hollowed out bell pepper.